We study how reported sexism in the population affects American women. Fixed-effects and TSLS estimates show that higher prevailing sexism where she was born (background sexism) and where she currently lives (residential sexism) both lower a woman's wages, labor force participation and ages of marriage and childbearing. 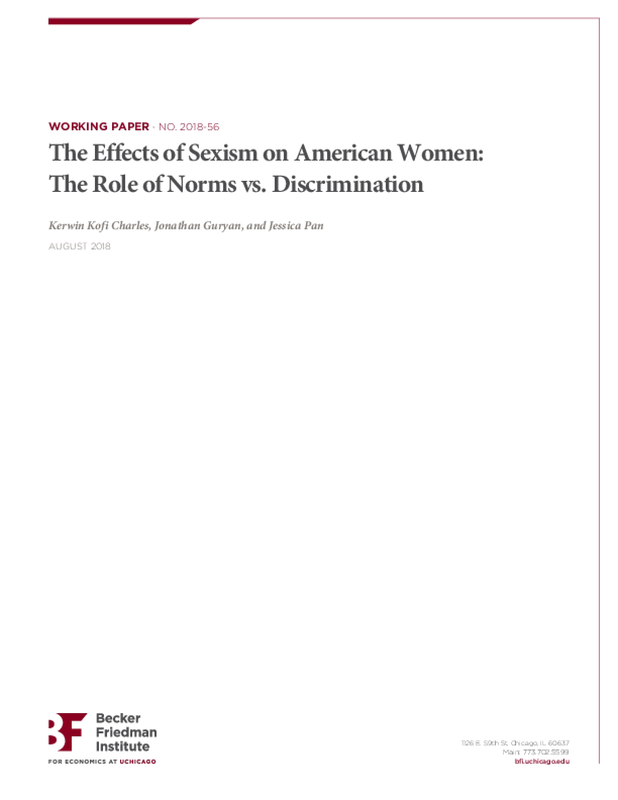 We argue that background sexism affects outcomes through the influence of previously-internalized norms, and that estimated associations regarding specific percentiles and male versus female sexism suggest that residential sexism affects labor market outcomes through prejudice-based discrimination by men, and non-labor market outcomes through the influence of current norms of other women. Copyright 2018 by Becker Friedman Institute for Economics at The University of Chicago. All rights reserved.